A movie based on a video game? How could this possibly go wrong! In all seriousness though, after the fairly average (exceptional by video game adaption standards) Tomb Raider, I was willing to not fully dismiss Rampage based on its history as an 80’s arcade game. However, the plot of Tomb Raider was based on a game from 2013 that was lauded for its cinematic qualities and narrative, as opposed to just the gameplay. In contrast, Rampage is a game where…three humans turn into monsters and attack a city? It’s potential for adaption isn’t crystal clear, to say the least. I should also preface my thoughts by saying that action isn’t my guilty pleasure genre of choice – my boyfriend, who professes that he loves this type of film, understands these points but was rather more forgiving. Basically, take me ripping a lot of this film to shreds with a pinch of salt, as I’m more into terrible romcoms than terrible action. 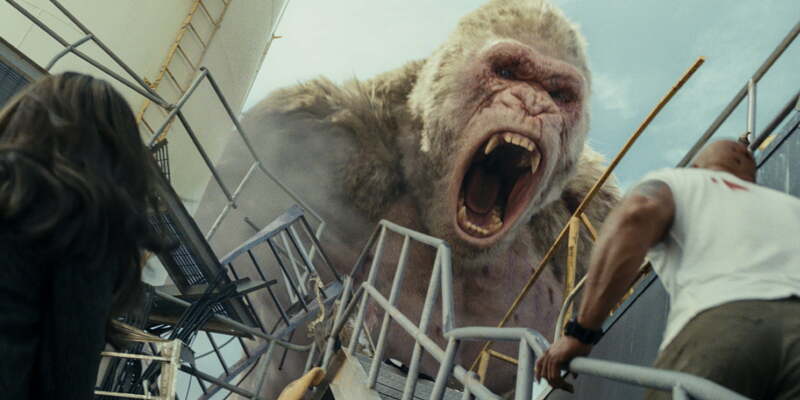 Needless to say, the best aspect of this film is Dwayne Johnson’s performance as Davis Okoye and his relationship with soon-to-be-giant albino gorilla George, who he saved from poachers as a baby. Their friendship almost reminds me of that in a buddy cop comedy, with George and Davis feeling like the good and bad cop respectively. However, despite the charisma oozed by Johnson, the script insists on his character being ‘not much of a people person’, and although the narrative is the most neglected aspect of the film by far, it does make you question why they even bothered to cast someone like The Rock for a role like this. Naomie Harris was also believable and delivered a good performance, but I honestly just felt like she was too good to be there (‘You were in Moonlight! What are you doing?!’). Another decent element was the CGI, which was fairly impressive and realistic: I never felt like Johnson was talking to thin air when addressing George in the film. However, that’s about it for the genuinely good elements, the rest leaning into bad or so-bad-it’s-entertaining territory. To start with the former, there are many plot inconsistencies that are incredibly distracting, such as characters getting shot and seemingly immediately recovering, and the way the various creatures transform being extremely different with no explanation. The cinematography, whilst not awful, goes downhill quickly from the surprisingly interestingly shot cold open set in space, going from cool camera movements to a simplistic overuse of shakycam and shot-reverse-shot. The predictability of the plot, whilst not too much of an issue due to the point of the film clearly being the decent action, leads sequences that are supposed to be emotional to become dull. Then there’s the writing. Good God, the writing. Whoever wrote the script clearly didn’t have any faith in the audience to understand anything that occurs in the plot, with such lines as ‘girls like him’, ‘we aren’t doing this for human betterment’, and ‘is he considerably bigger?’. The first and last quotes are both said by a character who only appears in the first act, and serves almost primarily to feed established information to the assumed drooling, mindless audience. The 2nd line, however, was said by the main villain of the film, played by human wood plank Malin Ackerman, to her brother played by Jake Lacy, who gives undoubtedly the most embarrassing performance of the film. Whilst Johnson seems invested in the film to an extent, and Harris even at her least interested is still a fantastic actress, these two showed up on set, insisted on doing each scene in one take, and ran off with the paycheck. Alongside weak performances, the motivations and plans of the villains are the most contrived, bizarre and nonsensical I’ve ever seen in a film like this. If big dumb action films starring Dwayne Johnson with incredibly vague themes of animal welfare are your thing, then go and watch this. If not, however, you may want to give this one a miss and use the money for a ticket to something more worthwhile (such as one of the several films still out in cinemas I’ve rated an 8 or 9 on this blog).